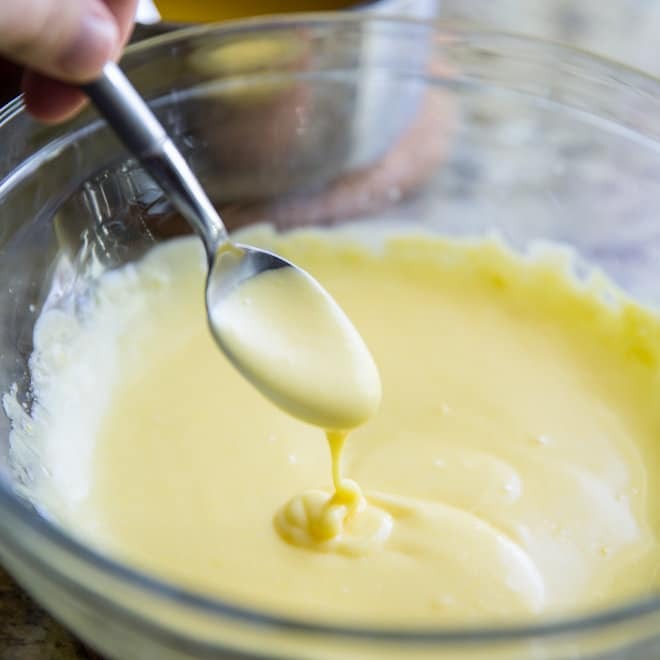 Learn how to make Hollandaise Sauce the traditional way, with a whisk! It sounds intimidating, but with a little patience, anyone can do it, I promise. I was telling my grandma recently, over the phone, that I’ve been making a lot of Hollandaise Sauce recently. As much as I’d like to bask in the praise and glory of being able to make Hollandaise, I’m here to tell you that A-N-Y-O-N-E can make it. Is Hollandaise temperamental? Yes, it is. Is it easy to mess up? YUP, that’s true too. But with a little practice, you can figure out not only how to make it, but how to bring it back from certain death. 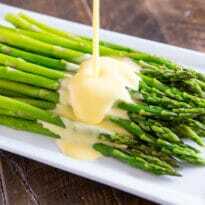 Hollandaise Sauce is an emulsified sauce that is essentially made up of two ingredients: Egg yolks and butter. Start with a double-boiler situation: A bowl (glass or metal) set over, but not touching, a pot of simmering water (around 180 degrees). Add your egg yolks and a splash of water. Now, whisk away! The goal here is to whisk the yolks until they thicken without overcooking the yolks. How do you know when they’ve thickened enough? Draw a line with your whisk through the middle. If the yolks stay put, you’re done. If everything runs back through the line, keep whisking. But, if they get too hot they’ll curdle (coagulated proteins, oy). What makes your sauce “too hot”? For me, sometimes my simmering water approaches a rapidly-boiling temperature. I may notice a burst of steam now and then coming out the sides of the bowl. If you notice in time, you can pull the bowl off the pot entirely for a few seconds, fix the simmering water, and return to whisking. If your yolks curdle or appear grainy, though, it’s game over. Once your eggs have thickened appropriately, take the bowl off the heat and immediately stir in a small amount of lemon juice. This stops the yolks from cooking. Now, the fun part. BUTTER. 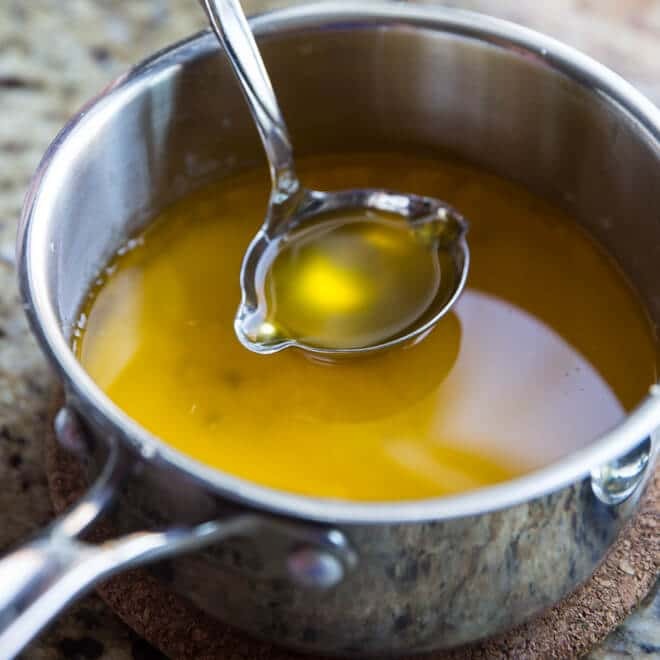 Drizzle in a few drops of warmed clarified butter at a time, whisking constantly to incorporate. You need to create an emulsion, but you have to start slowly with the butter. 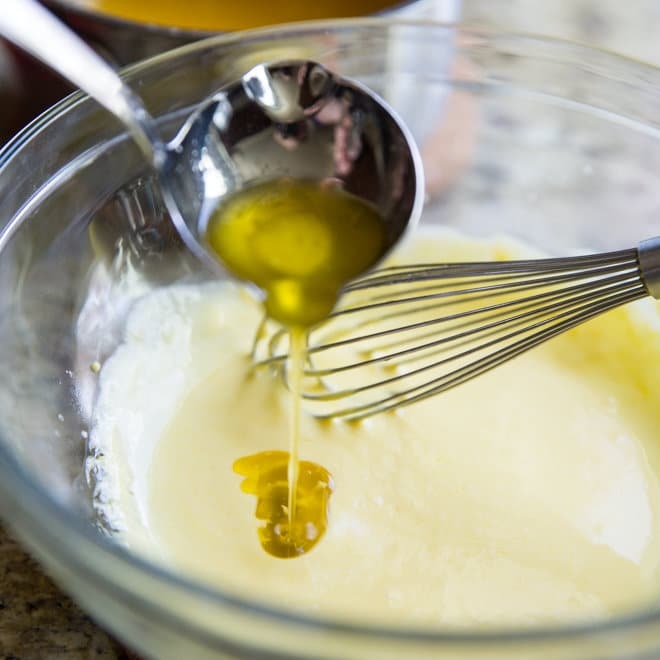 Once your emulsion has formed, you can add more butter with each incorporation. Once you have add all your butter, the Hollandaise Sauce should be smooth, buttery, and pale-yellow in color. Taste for seasonings (you’ll want to add salt for sure) and add a splash of tabasco or a pinch of cayenne if desired. 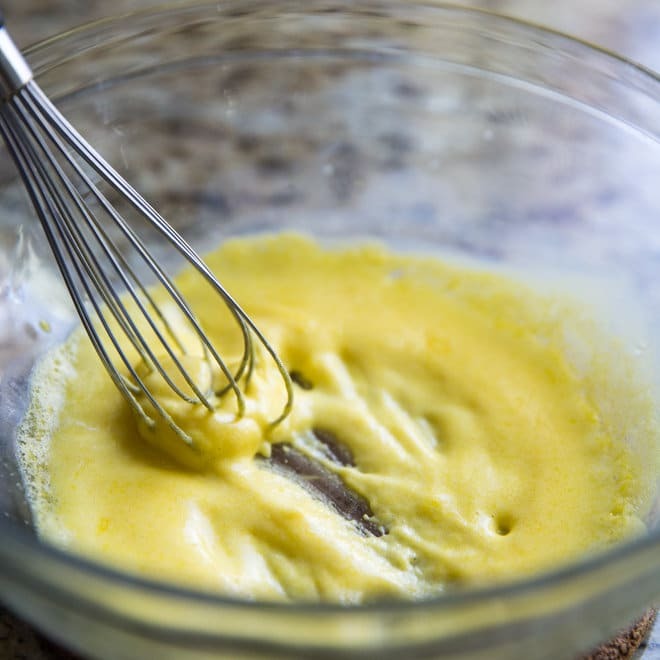 If at any point your Hollandaise seems too thick, whisk in a splash of warm water. Use Hollandaise as soon as possible. 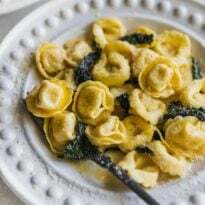 It will keep at room temperature for about an hour, though, so you’ll have time to poach eggs or whatever it is you need to do. Trying to keep the sauce warm (over a double-boiler, for example) is tricky. You’ll likely overheat the sauce and cause it to break (or maybe that’s just me). The better idea is make sure the food you are pouring it over is piping-hot. 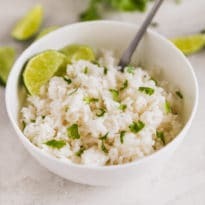 The sauce will likely thicken while it waits for you, so you can whisk in some warm water to thin it to the proper consistency (and warm it up a bit). So what do you think? Are you going to attempt this monstrosity, or what?! My yolks look grainy or curdled. Your sauce probably got too hot. Try pulling it off the double-boiler immediately to cool it down or stir in a small amount of cool water. I’m adding the clarified butter, but my emulsion isn’t forming. Everything looks like an oily, curdled mess. So many things could be going wrong. The yolks might be too hot or too cold. The butter might be too hot or too cold. You may have added too much butter too fast. Maybe you didn’t whisk quickly enough. My yolks are a very pale pink rather than pale yellow. Did you remember to separate your eggs? It sounds like you left the whites in with your yolks. My Hollandaise was perfect: Smooth, silky, delicious. But now, it’s breaking right before my eyes. Did you try to heat it while you worked on other food? If so, it may have gotten too hot. Why go through all the trouble of making Hollandaise Sauce, anyway? Well, sometimes we have dreams in life. 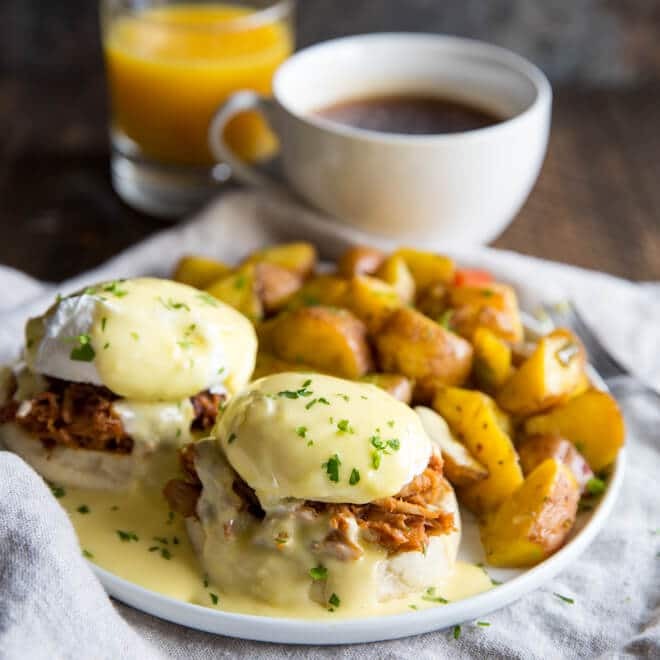 My dreams look a lot like Pulled Pork Eggs Benedict. Save this Hollandaise Sauce to your “Breakfast” Pinterest board! Set a glass or metal bowl over a pot of gently simmering water (do not let the water touch the bowl). Add egg yolks to bowl. 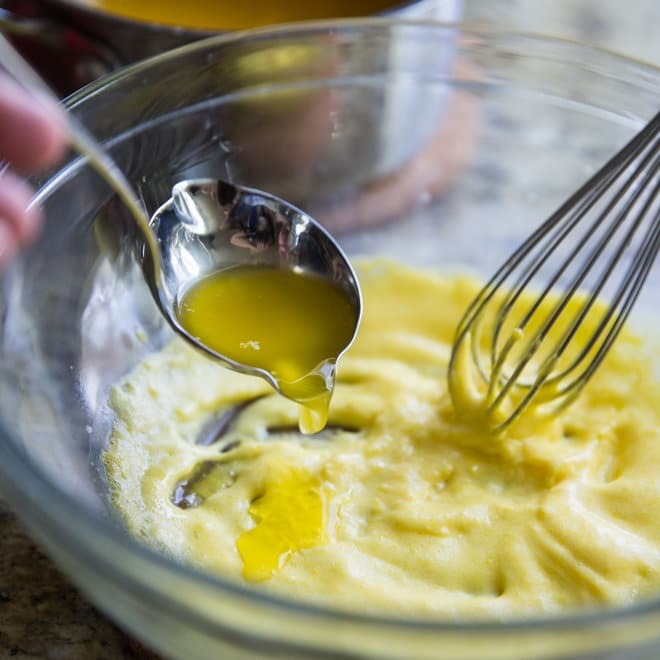 Using a metal whisk or wire whip, whisk the yolks constantly without overcooking the yolks. You'll know the yolks have thickened enough when you can draw a line through the yolks and yolks stay put. The line does not fill in. Use immediately or set aside in a warm (but not hot) place for up to 1 hour. If the sauce appears to thick, whisk in a few drops of warm water until desired consistency is reached. Adapted from "Hollandaise" in On Cooking. Thanks for a great idea on how to kick breakfast up a notch by using the best pork prep on earth with hollindaise sauce (who’d a thunk it?) 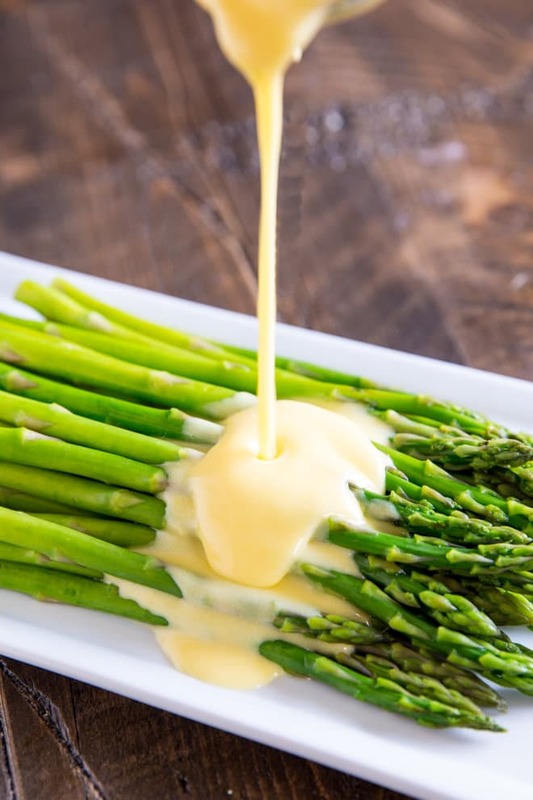 including that beautiful, steamed asparagus with more hollandaise. Referring to myself, one can Google anything and sound smart. So, in that regard, I’ll be blending techie with tradition. Since egg yolks set at roughly 158°, I’ll be making my whipped yolks, water, salt and pepper, sous vide @ 145° for 30 minutes worry free (techie) then whisking the mix with the lemon juice and warm ghee (tradition). If your sauce breaks, you can usually revive it by putting in a bit of heavy whipping cream and whisking it through. Like magic, it comes back to life. Excellent tip, thank you so much! I need to add that. First time attempting this, the eggs turned grainy and over cooked. I didn’t give up. Tried again and made sure that water pot wasn’t too hot, and that helped to keep the yolks smooth. Patience is required for sure but it was delicious! Seasoned with a hint of paprika and it looked restaurant worthy! Thanks for the detailed tips for this recipe.